What are all the files and directories in my account? How can I create my own "404 Not Found" error page? Our servers are linked to Frontier Global Center (FGC) by a fiber optic cable - making it unnecessary to link to the Internet through an OC3 or T3 Telecom circuit...no telecom circuit means that downtime-causing circuit failure is virtually eliminated! For support questions, please use Support Form or email Sales@OnTimeHost.Com. 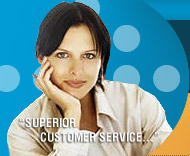 We will answer your email usually within a few hours, but always within the same day of your email. We have added this manual to provide you with fast answers. Always refer to this site before contacting technical support. We try to provide you with fast (within 2-3 hours) email replies but at times this is not going to to be the case since we can only handle so many requests at any given time. For billing questions, send an email to Billing. We accept Mastercard, Visa, Discover, and American Express. You may submit payment via secure server at http://OnTimeHost.com/payment.html. However, in the event that one of our servers do go down, it simultaneously sets off an alarm, that sounds much like a fog horn, and tends to cause people within our general area to head for storm shelter's due to their loudness. Let us assure you that we are aware of a down server before you are. We truly do not mind you calling us, but we would much prefer concentrating all our efforts on fixing the problem than answering the telephone. Wouldn't you? Our servers are configured to restart should there be a failure. The entire process takes approximately 10 minutes. If a server is down for more than 30 minutes, by all means call us! When you do place a call for technical support you will often get our voicemail, especially after normal business hours. This should not alarm you, it is simply an indication that our hands are full at the moment, so please leave a detailed message and your call will be handled promptly - either by a return telephone call or email, so PLEASE leave your account name and email address. We offer phone support, if needed, between the hours of 8:00 AM - 8:00 PM Pacific Standard Time. If you reached our voicemail, please leave a message your call will be returned promptly. Email support is 24 hours a day - and all email is answered and handled promptly. Remember, email is the most efficient means for providing technical support to our customers. We ask that voice support be reserved for emergency purposes only. Do not delete or change any of the directories or files that are located in your account other than uploading to your www directory with pages of your own design. The initial page of your site should be named index.html, this way when a user types in the url www.yourdomain.com, they are taken straight to the initial page of your site without any further input. domain-anonftp - this folder is used for your anonymous users to download public files. Of these directories, the most important one is named "www". Every account has its own separate "www" subdirectory. Files placed in the "www" directory are visible to remote browsers over the Internet, so this is where you want to place all your html documents, graphics, sounds, files, etc. which you want people to be able to access from the world wide web. For example, when a browser asks for URL http://yourdomain.com/page.html, Apache looks for the file: /home/yourdomain.com/www/page.html and sends it out. The system will automatically place any needed files in the other directories. All your HTML files and subdirectories should be placed in the www directory. Your CGI-BIN is also located in the www directory. REMEMBER - name your home page index.html or index.htm. Your first step is to create the HTML page you want to use as your error message and upload it to your www directory. Finally, upload your .htaccess file to your www directory. After you complete these steps, anyone trying to access a page that does not exist will be redirected to your error page.